15 major photographers of the city they saw. art ‣ Opening tonight at the Asian Cultural Center, 15 E. 40th [Mad], 12th Flr., 6-8pm, new work from contemporary Chinese artist Wenzhi Zhang. Her new series of lacquer paintings is called Back to Renaissance. 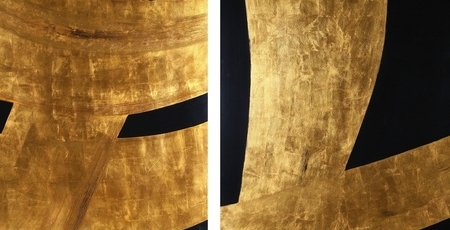 Today's main image at top is a detail of work by the artist. food ‣ The NYC Vegan Cook-Off: Hors d'Oeuvres Competition is ready to amuse your bouche on Sunday, June 2 at the Bell House. And they're still looking for home cooks to do the amusing. Got the mad vegan skills? Enter to win the for the glory (and the $250 cash for first place). Just want to taste? Tickets are $12. A bit of good-natured trolling: one of the judges is Dan Delaney of BrisketTown. website ‣ Moving on to real dogs… the newly launched website DogSpin helps manage all things dog-in-the-city, with services, stores and resources. movie ‣ On May 23, 7pm, a screening at the Explorers Club of The Last Safari, the story of war photographer Elizabeth L. Gilbert and her time in Africa spent in Kenya during the 1990s as well as covering the Rwandan genocide and civil war in Somalia. The film documents her return to Kenya where she shares her previous work with people in remote villages. $20, call to reserve: 212.628.8383.